For her research into the landscape and cultural complexity of Sardinia and Sicily, drawing and painting the landscape of the Southern Italian immigrant titled ‘Cross Cultures’. 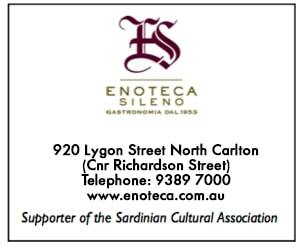 Scholarship funds utilised for exhibition showcasing the experiences of past winners of this scholarship titled “Images of Sardinia Through Australian Eyes” held at the Italian Institute of Culture. For her archeological research, including the reconstruction through computer simulations of the ancient landscape in south-west Sardinia known as the Bay of Oristano, from the Late Bronze Age (300BC) to the present time. For her photographic and theme paintings of the contrasts between Sardinian ancient architectural structures and the Sardinian landscapes titled ‘Images of Sardinia’. For her wide ranging theme paintings of the Sardinian land and seascape titled ‘Light, Water and Air’. For her study into the experiences of Sardinian migrant women in Melbourne, concluded in the form of a thesis titled ‘Remembered Places Are Ethnic Territory /Conversations With Sardinian Migrant Women.